Last week saw the demise of one of the greatest technological visionaries, Steve Jobs. While the world is slowly coming to grips with the fact of his departure, the buzz in the media has been of the leadership legacy that he left behind. In this article we wish to delve into some of the key principles of life he professed and how they resonate naturally from one spiritually inclined. Most notable of his talks was the one he gave at the Stanford University. He begins his talk admitting his failing to get to a formal college degree. Indeed, the true mark of a leader is his or her humility. Radhanath Swami often quotes how a fruit bearing tree is seen to be bent while a thorny tree is generally erect, indicating how one in knowledge (having good fruit) is naturally humble (bent). We can also note thesynonymy with the eastern paradigm that real knowledge is not a factor of formal education but rather a factor of keen awareness of one’s own frailties, and thus offering of respect to others. Steve shares three key messages in his talk. The first he refers as connecting the dots. In this he shares his life’s past and how the various events in his life made sense when viewed from the present. He gives an example of how his taking of calligraphy classes out of interest later paved way for the provision of fonts in computers – typography would have remained lackluster otherwise. This principle of connectedness, of making choices in one’s life, of following the yearnings of one’s heart,with belief that some higher power will lead us to an advantageous position that we may not be able to foresee, is an attribute all aspiring spiritualists should nurture. In a similar context, Radhanath Swami defines faith as that substance through which we can see the invisible, through which we can connect to the Absolute Truth, God. Second message that Steve explains is about viewing apparent reversals as having the seed for our future growth. And most notably Steve says that such reversals are inevitable and they are analogous to bitter right medicine that the patient requires. He refers to the incident where he gets thrown out of his own company that he founded after much struggle and how in that period of seemingly unfair treatment meted out by circumstance he discovers his innate creativity that becomes the foundation of his future success. Steve advises one to never lose faith in pursuance of one’s inner calling and to never get complacent of one’s situation in life. These form an integral part of the armor of a spiritual warrior – unswerving optimism and relentless urge to learn and grow. We see this principle very much illustrated in the life of Radhanath Swami also. In his autobiography Radhanath Swami shares the various gems of lessons he acquires as he passes through the crests and valleys of his journey in search for true substance in life. Finally Steve explains his perspective on death. This talk that he gave was in 2005. And in that year he was diagnosed with cancer. Steve compares this stark reality of inevitable death as the single best invention of life. Why because it clears out the old and makes way for the new. Given that everyone has this inescapable reality awaiting, Steve suggests one to not waste time living a life of pretense and to follow one’s inner calling with courage. Steve’s conclusion of his talk was this much quoted phrase that epitomizes his life: ‘Stay hungry, Stay foolish’. We find in the medieval history of India the life of a renowned spiritualist Sanatana Goswami. He was the prime minister in the kingdom of Nawab Hussain Shah of Bengal. He was the most sought after advisor to the King. He had riches and following. But he didn’t get complacent. He was well aware of the inevitable death and temporary nature of any situation in this world. He voluntarily gave up his position to pursue his inner calling to practice unalloyed, unmotivated, uninterrupted spirituality. This didn’t come easy as he had to overcome several hurdles including imprisonment. Finally when he got the opportunity to meet his mentor Sri CaitanyaMahaprabhu he submits himself as a fool, wanting to learn from his mentor – indeed he is considered to be the emblem of ‘Stay hungry, Stay foolish’. We pray and wish Steve to continue his journey towards higher realizations in the continuum of life that all of us are traveling. About the Author: Kaushik Balasubramanian obtained his post-graduate degree in the field of Electrical Engineering from IIT Bombay. Subsequently he joined Intel Corporation based at Bangalore. He has a technical profile at Intel. He was part of the team to design Intel’s first 6 core and 10 core server microprocessor and is currently working on future generation of microprocessors. His acquaintance with spirituality began in late 90s during undergraduate studies at Mumbai. He continues to be fascinated by the Vedic paradigms on one’s true identity, relationship with the Supreme Being and the process to revive the same. He strives to incorporate elements of the teachings of the Bhagavad-Gita in his lifestyle. He also mentors students from the Indian Institute of Science, Bangalore on the teachings of the Gita and shares his experience with spirituality with interested audience from all walks of life. He is also an avid traveler, especially to places of Vedic heritage. More from this author. Nice connection between Steve Jobs and sanatan goswami. Thank u for wonderful article. Thank Kaushik for this beautiful article on Steve Jobs. I was deeply inspired to read about his life his advice to follow the yearnings of one’s heart,with belief that some higher power will lead us to an advantageous position that we may not be able to foresee. Thank you for giving these spiritual perspectives in regard to Steve Job's address at Stanford. Amazing spiritual analysis. Thank you very much prabhu. Thank you for sharing such a nice article and explaining us the three things (faith, to face the reversals and death) to always remember in life. What a powerful statement – ‘Stay hungry, Stay foolish’!! Thank you for sharing this article. From the life of Steve,we can learn to focus on faith, how to face reversals in life and death for being a good leader. Radhanath swami also explains the same. I also pray and wish Steve to continue his journey towards higher realizations in the continuum of life that all of us are traveling. …now that requires refined intelligence to connect the things of this world either in activity or coming through words to GOD which is done here so brilliantly. Whatever leaders do, common men follow…..very inspiring!! What an article !! 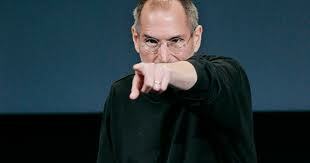 Thanks a lot for beautifully presenting the values that Steve Jobs had imbibed…. Introspecting deep, they seem spiritual. HH Radhanath Maharaj also hear His inner calling, had full faith in it, pursued it and is guiding thousands of people around the world… Steve Jobs founded Apple overcoming many challenges and gave thousands of devotees his wonderful products to use in the service of Krsna… and Maharaj travelled from Chicago to India overcoming innumerable challenges and gave thousands of devotees different types of seva to serve Krsna and His devotees… this article is too good…. Hare Krsna !! Well written article. Important lessons to be thought over. This is truly an inspiring post. i like this point that, how a fruit bearing tree is seen to be bent while a thorny tree is generally erect, indicating how one in knowledge (having good fruit) is naturally humble (bent). true mark of a leader is his or her humility. nice example of tree is given is this regard. Thank you for sharing such a nice article which helps us to understand how we should be viewing life when there are a lot of reversals. Hari Bol. Thank u sharing this leadership example with us. very good article. the point of connecting the dots makes lot of sense. no experience goes waste in life. whatever we go through, even if it appears a wasteful and unproductive experience with no utility now, later a time comes in our lives when this very experience helps us in some way. if nothing it helps us speak about it in some lectures. when i prepare for my discourses or sometimes in the middle of a talk i remember incidents that relate very much to the present discussion. however when those incidents actually happened some years ago, they didnt make so much sense then. i guess that's life for you. kaushik has highlighted this aspect very nicely. also i liked the observation on humility and formal degrees having little to do with one's ability to learn and grow in life. Very meaningful article.Thank you very much for this. Thank you for sharing this wonderful article on Steve jobs and the values he has left behind for all of us. Very inspiring! thanks for showing the spiritual side of steve jobs..haribol!!! very good article by kaushik – bringing out not only the most essential qualities but grounding them in deep vedic principle. Thank you very much for this wonderful analysis of the philosophy that Steve followed and interesting to know that how it was quite in line with vedic thought. Very inspiring. Thanks for sharing it. Very nice article.The faith shown in higher power by Mr.jobs is exemplary.Such a faith is very encouraging for aspiring spiritualist.Also Vraj Vihari Prabhuji's comment tells all other aspects of the article by Kaushik.I am fully agree with his views.Thank you very much for sharing with us. Wonderful example of what it means to follow vedic system. Very nice article. Must appreciate Steve's ability to take reversals as an oppurtunity to grow further. Also his realization on death is very touching. Nice point – “Steve suggests one to not waste time living a life of pretense and to follow one’s inner calling with courage.”. This we see from life of Radhanath Swami also as he travelled from middle east to India under an urge to search for GOD. Wonderful article on Steve Jobs and the legacy he has left behind for all of us. We can learn so much and try to apply the principles in our lives. When we act according to the inner calling and have full faith in that inner calling and the God then we will be successful and happy in life and during death. Thank you very much for sharing this wonderful article. A very good article with good analogous teachings of Radhanath Swami’s teachings ! What’s inside us, is also what we perceive outside of us.Dear Kaushik, you have a wonderful attitude of looking at good aspects of others and connecting them with spirituality. Many would hear Steve Jobs lecture and figure out what they could gain from such lectures to prosper materially and become so called leader. But due to yoiur spiritual attitude, you have drawn wonderful spiritual lessons from the same lecture and presented it for the benefit of readers. Thank you so much.